“I practice work flexibility every single day,” says Anne Donovan, the U.S. People Experience Leader at PwC, who is enjoying the fresh air in her own backyard while on a call with us. She’s able to do this because PwC has spent the last decade building a culture of “everyday flexibility” that allows employees to work where and when they choose. When her two daughters were younger, this flexibility was perfect for Anne and allowed her to spend more time with them. Now they are grown and off to college, but she still prefers not to work in the office and has the ability to adjust her schedule as needed. And she’s not alone — work flexibility has become increasingly important in the past four years with a 24% increase in the number of people who say flexible work arrangements are a very important factor when considering a new job, according to our Global Talent Trends 2019 report. In fact, PwC’s “everyday flexibility” policy has helped it make Fortune’s 100 Best Companies to Work For list 15 years in a row. But the culture of flexibility didn’t materialize overnight. 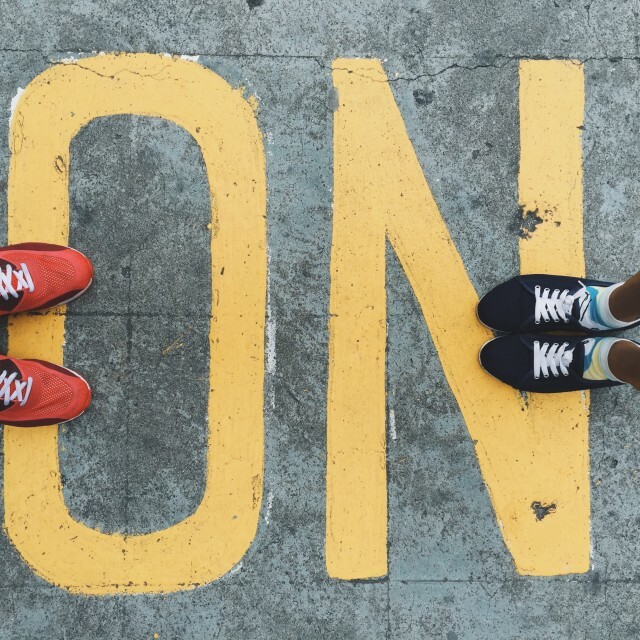 Here are Anne’s tips for making flexibility work for everyone — and how you can nurture a flexible culture like PwC’s in order to boost your employer brand, increase employee retention and productivity, and more. 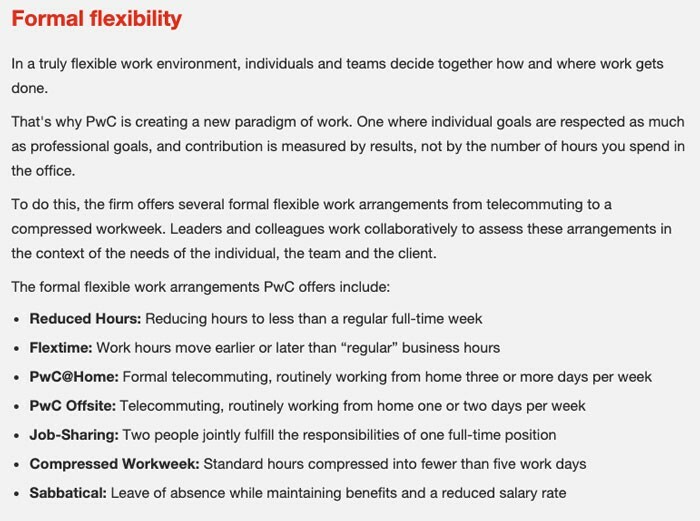 PwC’s move toward a culture of flexibility began around the time millennials entered the workforce. Since then, flexibility has only grown more important to candidates. And companies are responding: data from LinkedIn’s Global Talent Trends 2019 report shows that there has been a 78% increase in job posts on LinkedIn that mention work flexibility since 2016. For many millennials, more flexibility correlates with greater loyalty to the company — with the majority even willing to take a pay cut to find flexibility elsewhere. If you’re not sure whether employees will embrace flexible work options, find out what they really want and ask how they see it working. Maybe they want certain things and not others and that’s okay — flexibility is, by nature, optional. And by understanding what your employees really want, you can create a policy that is unique to your company. Flexible work options can be especially valuable to some employees, like parents re-entering the workforce. But everyone can benefit from them, regardless of their age or circumstances. PwC’s flexibility policies are predicated on the belief that everyone’s reason for wanting them are equally valid. That’s why the company has been careful not to highlight any particular segment of the workforce in its messaging. Giving everyone the same options is vital if you want flexibility to become a core part of your culture. Otherwise, it can feel too exclusive, making some employees feel left out. But it’s also important to be flexible about what flexibility means. Everyone’s circumstances are a little different, so people will embrace it in different ways. At PwC, there are no hard-and-fast rules. Employees are empowered to make flexibility work for themselves and for their teams however they see fit. Lastly, it’s okay to have loose policies in place, like letting your coworkers and managers know when you’re taking the afternoon off, rather than just disappearing. But being too rigid about flexibility makes it difficult for employees to adopt and embrace the new mindset. Clearly communicate the boundaries, but give people room to breathe if you expect a policy to catch on and stick. Some companies are wary about offering flexible work options because they think productivity will suffer. But PwC says it trusts its employees no matter how flexible their schedule is or how long they’ve been with the company. After all, the firm hired them for a reason. At PwC, trust means more than simply letting people work without the company peering over their shoulder. By placing its trust in all its employees, PwC also trusts that they’ll return the favor and be flexible when the company needs it. Since business needs can fluctuate as quickly as an employee’s own circumstances, creating a culture that emphasizes mutual flexibility can be beneficial to both sides. That way, working different hours when the company needs it feels less like an unwelcome obligation and more like loyalty to an organization that invests in its employees. 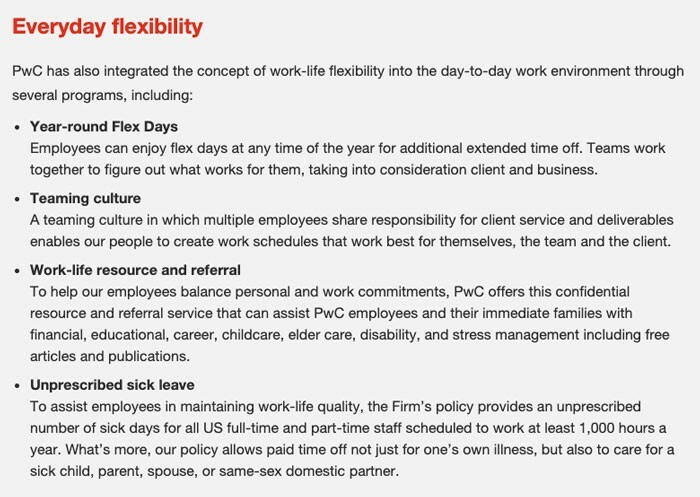 Today, flexibility isn’t just a policy at PwC. It’s a major part of the company culture that employees live and breathe every day. Getting to that point takes time, effort, and a little trial and error. Something you can start doing right away is talk about flexibility as much as possible. This will help the idea take root in employees’ minds, allowing it to grow into something more than just words on paper. Getting leadership actively engaged in the process was a major step for PwC. Anne recalls that in the past, cultural change had typically come from the top down, so it was important for employees at all levels to be involved. Get everyone talking about flexibility and participating in the program. Make sure that managers lead by example to help other employees feel comfortable working flexible hours themselves. It may feel strange at first because real and lasting cultural change takes time. Like anything else, if you do it enough, it will soon become second nature. According to our report, flexibility can improve retention, morale, and work-life balance, which in turn can make employees happier and healthier. And PwC is proof of this. Flexibility has had a significant impact on engagement — and it’s become a proud feather in the recruiting team’s cap. 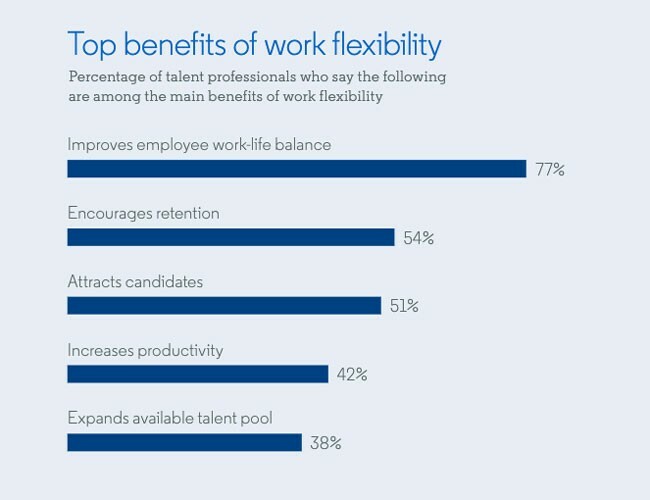 As demand for flexibility increases, offering flexible work benefits will help set your company apart from the competition. And if you don’t offer them, you risk being left behind.